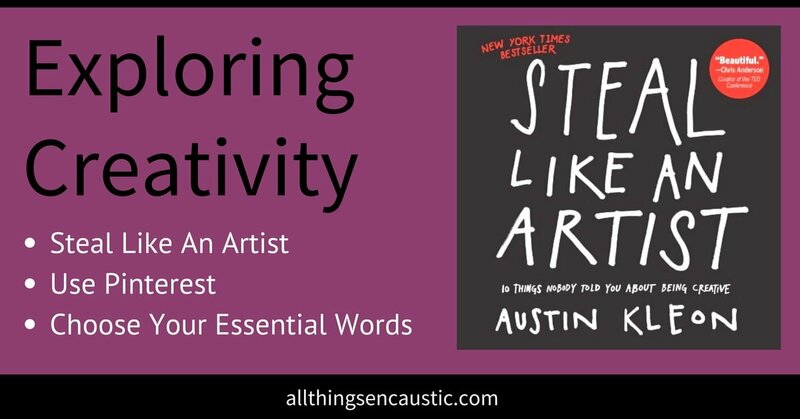 As I explore creativity in my own life, I have been reading Steal Like an Artist: 10 Things Nobody Told You about Being Creative by Austin Kleon. In this book, Kleon isn’t suggesting that we plagiarize or break the law, but he does give us permission to look at the work of others for inspiration and education. We learn by copying. Educate yourself by copying the work of your favourite artists. Discover what they were thinking, start to see things from their perspective. Surround yourself with things that inspire you. Mashup and reimagine the work of several artists to discover your own path. At the same time I’ve been attending Andrea Bird’s Connect and Create Sessions, the same group of artists meet once a month. Andrea sends us a monthly focus that guides our discussions before and after we paint. Andrea had us choose our essential list (read Andrea’s post about this exercise here). I’ve done this exercise before to find a list of salient words to speak to my inner critic. But this time I found it difficult to narrow down my list without a focus. Before choosing my essential words I decided to constrain my focus. I created a Pinterest board and then compiled my list of words by looking at that board. Why did I pin that painting? What drew my eye? What inspires me? What do I want to steal? I created a private Pinterest board called Steal Like an Artist. When you Pin an image Pinterest suggests other similar images that you may also want to pin. Before I knew it I had a very narrow focus. I had pinned abstract landscapes and seascapes (see the renamed and now public board here). As I then looked at the board and analyzed why I had pinned the image, it was very easy to select my essential words from the provided list. Create a Pinterest board of paintings that inspire you. Ask yourself—Why did I pin that painting? What drew my eye? What inspires me? What do I want to steal? Now look at your own art and compare it to what inspires you. Can you strengthen any of these qualities that you admire in your own encaustic paintings? Now go and make art. You’ll find that as you paint you aren’t copying one single painting but you are creating something that is your own work. Please add a comment. I would love to hear if this creativity exercise was helpful for you. And pick up a copy of Steal Like an Artist: 10 Things Nobody Told You about Being Creative by Austin Kleon. Thank you for your post as it validates what I’ve already been doing. I have an extensive Pintrest collection of other encaustic artists that I peruse when I need an inspiration in the studio. Mostly it will be to try a new technique but sometimes a particular composition is so striking I need to try my own version of it. I am very diligent to make sure the work is my own though. I use other artists work in only the broadest of strokes. If you haven’t already read Steal Like an Artist: 10 Things Nobody Told You about Being Creative by Austin Kleon, I suggest you pick up a copy. I keep picking it up over and over again. Thank you for this. I’ve just recently discovered Encaustics and I’m yet to paint my first piece. I’ve finally got what I need to get going and your article has given me somewhere to start. That’s nice to hear. I suggest that you read the FAQ post first. And if you have any other questions feel free to add comments to any post. There are amazing teachers running workshops too. I enjoy reading your posts. I have a lot of the supplies I need for encaustic painting and have tried on my own to do some work. Whew!!! What a lot to learn. I lIke the ideas you have given here and will try the Pinterest board. I have a paper file of photos, fronts of Christmas cards, ripped out pages of magazines and catalogs…. lol but having access digitally with suggestions from Pinterest sounds fun. Thank you! also, can you suggest a website that might provide names of artists giving encaustic classes? Thanks Sally. I’m glad that you enjoy the posts. 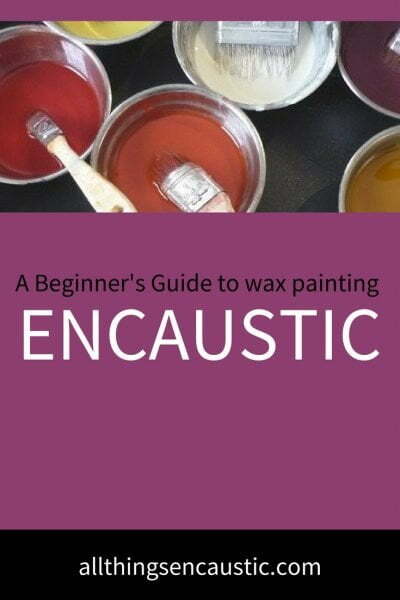 It is hard to provide a directory of encaustic workshops. 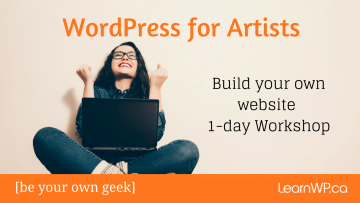 There is some online training available but in-person workshops come and go. I suggest you check Facebook groups to find an instructor in your area.